Almost every new parent knows the feeling: It’s 2 a.m., you’re bleary-eyed and you want nothing more than everyone to get some sleep. However, you’re up, and so is your new baby. Though most parents wish their little one could tell them what’s keeping him or her awake, sometimes there’s no clear answer. 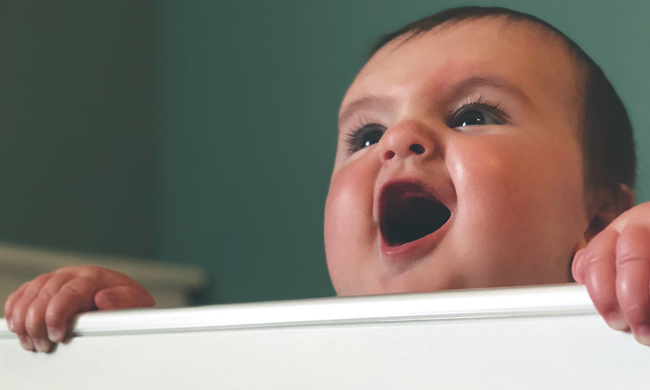 To help parents who are looking for answers to the questions that keep them awake, including those regarding poop, sleep and tummy time, the experts at KinderCare, who’ve been caring for new babies for almost 50 years, offer this advice. 1. Why is my baby’s poop a weird color? Flash back to before your baby was born: You probably never imagined you’d be searching the internet for answers to questions about poop. Yet here you are, and many new parents know how you feel. When you have questions about poop, however, you may find there’s an app for that. Many apps also track sleep, feeding, pumping, weight and more, making them useful tools to add to your new-baby starter kit. If you see a change in your baby’s poop, track it. It might be no big deal, but it’s easier to remember what happened a week or even a day ago when you have all the data right at your fingertips. Also remember, if you see anything out of the ordinary, it’s worth a quick call to your doctor’s on-call nurse hotline to make sure it’s nothing to worry about. 2. What’s the big deal about tummy time? You’ve probably read how important tummy time is for developing your baby’s muscles to get ready for all of the crawling, rolling, scooting, sitting and walking ahead. While your baby’s back is still the safest place for him or her to sleep, awake and supervised tummy time is important, too. Tummy time doesn’t have to be long to be effective. Talk to your doctor to see what’s recommended for your baby. Though tummy time can be any time, you might be more successful right after a nap or diaper change when your baby is well-rested and comfortable. If your baby just won’t take to tummy time, try making it fun with toys and make sure you’re getting down on the floor to play, too! 3. What if my baby just won’t go to sleep? It’s never easy to hear your baby cry, but Dr. Elizabeth Super, a pediatrician and children’s sleep specialist with the pediatric sleep medicine program at Oregon Health & Science University’s Doernbecher Children’s Hospital, has some advice for sleep-deprived parents. According to Super, by around 6 months of age, many babies no longer need a middle-of-the-night feeding and are ready to start learning how to self-soothe. However, about 25 percent of 1-year-olds still have problems waking up in the middle of the night. In other words, if your baby has trouble sleeping, you’re not alone. There’s no one-size-fits-all solution, and it’s important to choose an approach that fits your family. That might mean adjusting your schedule to accommodate an earlier baby bedtime (Super recommends 7-8 p.m.) or coming up with a simple bedtime routine like taking a bath, brushing teeth, reading a book, and going to bed. For answers to more questions that can keep new parents awake, visit kindercare.com.